Coming straight from the Bad Season mixtape, the official “Ego Trippin” music video has hit the web. 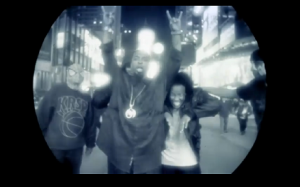 As some of you may recall, Tech N9ne and Strange Music were on location in New York City to shoot the video. “Ego Trippin” features Krizz Kaliko, and special cameos by Kutt Calhoun and DJ Whoo Kid in facepaint. The gritty video, shot through a fish eye lens, gives fans a look at the bizarre world of Tech N9ne. The video is slightly out of sync with the audio but we will be on the lookout for a sharper version to replace the one currently available. Watch “Ego Trippin” here or scroll down below.